The Mid-Valley Wine Trail is a wine marketing group of seven wineries located in the towns of Dallas and Rickreall, west of Salem. The City of Dallas is a major financial supporter of the group. Among the Mid-Valley group, the owner of Johan Vineyards, Dag Johan Sundby, and his winemaker, Dan Rinke, have initiated the organization of the proposed Van Duzer Corridor AVA. Focus? 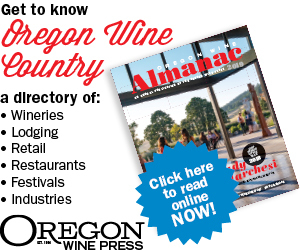 The Mid-Valley Wine Trail — and proposed Van Duzer Corridor AVA — are intended to promote our portion of the Willamette Valley. The wines here have a unique character and we want consumers to know about it. Identity? The proposed AVA is all about a mesoclimate created by the Van Duzer Corridor. Essentially, the AVA is about wind and its unique impact on a wine’s character. We are seeing a strong identity in the wines coming from the area. Structures based on acidity, bright red fruits, elegant frames. We are a cool-climate region and moderate alcohols should be the norm for the wines coming from it. Varieties? Pinot Noir, of course. Chardonnay and Pinot Gris also are showing promise. The acidity in the white wines is racy and distinct. Collaboration? The process of developing this AVA has been extremely collaborative. A year after beginning the process, we are still inviting growers and having conversations. Challenges? Currently, the (proposed) AVA is sparsely populated by vineyards and wineries; this makes drawing visitors a challenge. Fewer producers also means fewer opportunities to gain recognition nationally; we need to build our reputation. Marketing? Social media and word of mouth are the most cost-effective ways for us to promote the area. We’ve partnered with the City of Dallas, and they’ve graciously donated money to the MVWT that has allowed us the opportunity to advertise in the Oregon Wine Press. We utilize mailing lists to send invitations and notifications and promote upcoming events.